Wanted to have iOS on Windows, if yes try iPadian. iPadian is an iPad emulator. You can have access to free music and videos , Social Chat , Facebook Notification support and many more iOS apps . The application has built in free app store , pre-installed with some iPad apps. iPadian also contains the right side bar which gies you access to Facebook , Windows Live Messenger , Youtube , Wikipedia , Google+ , etc. 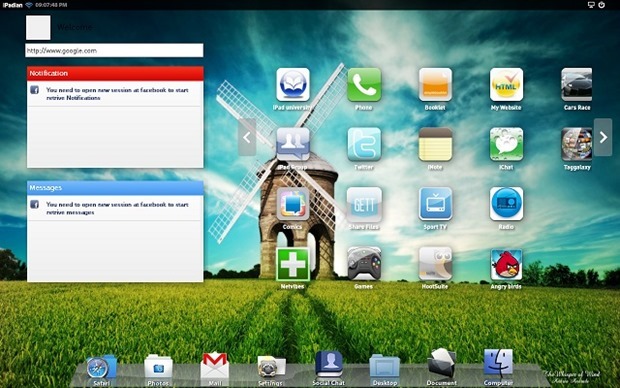 The screen shot below shows how the iPad Emulator looks. 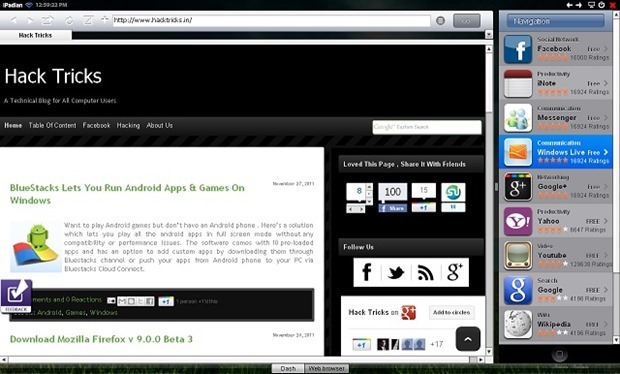 The screenshot below shows this site opened in its built in safari browser from Apple . The image also gives you a glimpse of the right sidebar which acts as a very handy tool. The project is very new and unique and is open source. iPadian works with Windows XP , Vista and 7.